What’s more important – that a book is well written or that it has an engaging story? I’ve always been firmly on the side of story. If the story isn’t compelling then it surely doesn’t matter how beautifully it’s been written. That’s what I’ve always thought, at least. However, I am now reading a book that’s making me rethink my position. 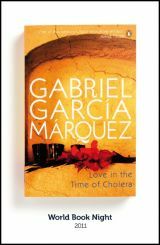 I managed to get my greedy fingers on not one, but two, of the titles for World Book Night, one of which was Love in the Time of Cholera by Gabriel Garcia Marquez. It is 348 pages and I am up to page 116, and I am completely and utterly gripped – not by the story, but by the writing. It is one of the most exquisitely written books I have ever come across – and I do consider myself to be pretty well read. There is an effortlessness in every sentence and I feel like this book is showing me just how great the written word can be. So far this year I have read a lot of just-released books, and have found many of them to be insipid and bland, and now that I am reading Marquez, those other books seem even more insubstantial and unsatisfying – like having a glass of water for dinner as opposed to a three course meal. Time of Cholera is something to really get your teeth into and, right now – just over 100 pages in – I feel like the book is nourishing my reader’s soul. I am not massively engaged with the characters or their story (although I suppose that could still change), but, with this book, it honestly doesn’t matter. I feel almost hungry for Marquez’s words. How refreshing to read a book that is not a fast-driven frenzy of activity from beginning to end. What a welcome change for there to not be some sort of fight scene or car chase on every page. This is a book that allows itself to breathe – and is all the better for it. Pace is something I am painfully aware of with my own writing. I’m aware of a constant pressure to make sure the action doesn’t slow down, even for a second, in case – God forbid – the reader gets bored, and the reviewers begin baying for your blood etc etc. Surely we have not sunk so low as a society that all we want to see is pretty people running away from explosions? It is a notion that I dislike intensely. Not so much for Lex Trent or other comic fantasies because they’re naturally more fast-paced – but for serious adult books I find it very frustrating that there should be such a single-minded focus on grabbing the reader’s attention by doing the writing equivalent of bashing them over the head with a heavy object. Personally, I generally dislike books that start with action scenes or fights or chases. They bore me. If I don’t know the characters yet then I couldn’t care less what happens to them as they run madly through the house whilst being pursued by a werewolf/man with gun/love-sick sparkly vampire. Still, I am told that this is what most people want in an opening chapter. In the story versus style debate I would hold up Dan Brown as a brilliant example of the former. I realise it’s dreadfully unfashionable of me to like Dan Brown, and many people (some of whom openly admit to having never even picked up one of his books) seem to almost fall over themselves in their eagerness to proclaim that the man cannot write, or that his writing style is clumsy at best. I do not accept this. I think Dan Brown is a very skilled and intelligent thriller writer, and no aspirations to literary snobbery will make me say otherwise. Dan Brown does not write beautifully but the stories he tells do not require that he should. I enjoyed The Da Vinci Code but I absolutely loved The Lost Symbol. I devoured it because every time I got to the end of a chapter I couldn’t wait to learn what was going to happen next. It gripped me very differently from the way Time of Cholera is gripping me now. I am in awe of Marquez’s writing – literally, I am in awe of him – but I’m still more likely to take a Dan Brown book on holiday with me, or reread a Dan Brown book, or rush to the cinema to see a film adaptation. I am still more likely to eagerly seek out other work of Brown’s that I have not yet read – not because I think his books are better than Marquez’s but because, for me, story is still more important than style. I read Brown’s books – and others like them – for a different reason. Fundamentally, I read those books to enjoy them as a reader, whereas a book like Love in the Time of Cholera I’m reading mainly as something to aspire to as a writer – a fondly nurtured dream that perhaps if one worked at it solidly for fifty years or more, one might become even half as good.